It’s a lot of fun to repair your own fiddle. I have one fiddle that is over two hundred years old, which I found in bits, with all her varnish stripped. She would surely be worth more financially if I had had a restorer fix her, but I did it myself, she sounds and plays wonderfully, and I get a real kick out of the fact that I saved her myself. Because, believe me, she was kindling-wood before. That brings me to an important point. There is one rule which you should bear in mind whenever you touch an instrument with a mind to fixin’ her. Never, EVER do anything that cannot be completely undone later. This is particularly true with older instruments, which are not only beautiful to play and listen to but are works of art in their own right. Okay, so a workshop fiddle from the Mittenwald may be no Mona Lisa, but it’s on a par with the old etchings that were produced in similar numbers and are now so sought after. With my old fiddle, I have done nothing that can’t be undone. I repaired her tragically splintered top using proper luthier’s hot hide glue and tiny cleats of top-quality instrument-grade spruce. Someone had committed the cardinal sin of stripping the varnish, and I know my own limits there, so I finished her with French Polish, which sits on the surface of the wood and can be removed completely with alcohol, which itself evaporates and leaves no residue. I made no changes to the structure of the violin. A real restorer could easily take her back to the state she was in when I found her and perform a complete restoration, and you would never know I had done anything at all. Indeed I hope that after I am dead and gone, someone will do just that, and give her another two hundred-odd years of music-making. 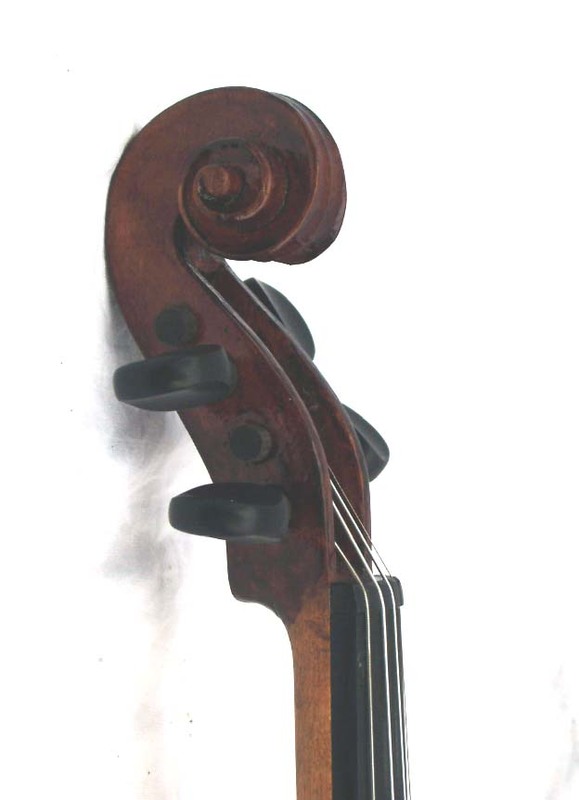 With violins we are actually quite lucky because so many of the parts are not actually “of the violin” but effectively are “consumables.” These include the tuning pegs, endpin, bridge, saddle, top nut tail-gut and tailpiece. All of these may be replaced by the player. Maybe you won’t get it quite right first time, but the learning itself is fun. More structural, and to be treated with much more care, are the sound-post and the fingerboard. Nevertheless, these too will have to be changed sometime in the life of the violin, and they can be replaced by the player. Any French, Bohemian or German violin made before WW2 will be a decent instrument, even if it did come out of one of the factories in Mittenwald or Mirecourt, and anything with a “real” name on it will be a damn fine fiddle. Furthermore there is absolutely no doubt that the best thing of all for a violin is age, the more the better, and there are huge numbers of really nice fiddles around made between 1880 and 1939. Often these instruments can be picked up for under a hundred Euros, which is ridiculous when you think what they compare to (or what smart violin boutiques would charge for them after a good clean and a new set of Dominants….) I will discuss what to look for in the search for an old instrument later, but for now we’ll assume you already have an old fiddle or at least have one in mind and want to know what is involved in getting her to play properly. Perhaps you are a player, or maybe you or one of your kids has a fancy for the instrument and there’s that old fiddle Granddad had still up in the loft….Dang, I’m sure the old guy said it was a Strad….. I found your site looking for help on diy violin repair. I have taken a low-(but-not-bottom-of-barrel-low)-appraised-value violin (at least 50 years old, as I knew the woman who played it in her childhood, no other history known, except she claimed it came to her in the coffin case that looks to be c. 1900) to a few luthiers who have all told me that the repairs would likely cost more than the value of the instrument. I play other instruments, including cello, and am determined to get this little fiddle playable, without spending too much. Most of the work is stuff I’m reasonably confident doing, replace a single peg, new bridge, repair a cracked tailpiece, and possibly touch up the beat-up finish somehow (I’ll do more reading before tackling that last one). The biggest roadblock for me is that the neck is loose from the body. I am planning to use rabbit skin glue (unless someone tells me it’s substantially different from other hide glues) because I already have it. I have found lots of places that tell me that the angle of the neck/fingerboard is very important, but I can’t seem to find anyone with a thorough guide as to how to know what the right angle is, and how to make sure that it is at that angle when I glue it… at least not in laymen’s/player’s terms. I wonder if you’d be able and willing to shed some light on this slightly more advanced fiddle repair? That’s a little more serious, but not terminal. Unfortunately you might have to take the back off the violin in order to reglue the neck block properly, if it has come loose inside the body. If it’s just that the neck tenon has separated, and the block itself is solid, then it’s relatively simple. The good news, however, is that I have a fiddle here with exactly the same problem and I have been meaning to fix it for ages. Would you like me to do a step-by-step article on how to do this? I’d cover separating the back, doing the repair and re-gluing the back. It’s a bit more of a challenge but really not that hard. I could do a video too. Let me know. I have some free time this month, I could do it then. The rabbit glue will be fine, all the hide glues basically are the same. The angle neck/fingerboard is important, but you’ll find that if you’re just re-using the original parts this will fall close enough. Different if you have to make a new neck block because the old one is unusable, but we won’t assume that just yet, and anyway, careful measuring will get you there even then. A step-by-step article would be fantastic! I’m not entirely positive whether I’ll need to remove the back or not, as the neck on mine is not completely separated from the body. I’m so happy that you would be willing to help out with this project! I’m almost tempted to take the back off just to get the experience of doing so, even if it doesn’t need it. But I’m not sure about doing more than necessary. Is there any way I can be helpful in the process of getting the article together? I may also decide to make a parallel article about following your instructions on my own young blog. Thanks for your reply! I’ve really enjoyed your site so far! I am busy all this week but after the weekend I have some time so I will post an article then. Of course, I knew your general location from elsewhere on the site, and I’m in the mountains in Pennsylvania. I’d meant photo processing and the like, but I’m sure you have all of the technical stuff handled. Your website is easy to use and looks great. I’m in no grand hurry to get this repair done, and I *may* have enlisted the help of an apprentice luthier, so in your own time, and if it pleases you. Your posts have already helped me with my ‘cello and her maintenance, which I am grateful for, as well. I do hope to get my hands on other instruments in need of some TLC (that is, inexpensive or free plus work and care) and I haven’t seen the info anywhere else online. I love your work, now that I’ve gotten my eyes on a larger chunk of it, thank you for sharing, and I’ll be keeping my eyes on updates! Happiness and hope to you and yours, Mr. Fleming! Hi I am so sorry not to have replied sooner. it has been mayhem here! I will get the repair done as soon as I can set aside time, and thanks for the support! Rod: I have a low spot on my fingerboard, minuscule but can affect intonation and ruins a vibrato with the third finger. I am contemplating fixing it by filling in with bondo, plastic wood or some such filler, and very carefully sanding/scraping down to level. I am pretty experienced with wood, tools, home improvement, etc. Any advice, or should I just take it to a fiddle repair shop? That’s one of those questions. It depends on the value of the instrument. The proper repair would be to remove the nut and resurface the whole board down to the level of the hollow. Then adjust the bridge and the nut till the action is right. I’ve never seen a board that didn’t have enough meat to do that. Ebony, even though it is hard and dense, is really easy to sand, and if you go down this route remember to use a backing board behind the sandpaper. Proceed very slowly and check often with a straightedge. Remember that there should be a slight relief in the board to allow for the curvature of the sounding string. Measure this at the octave with a straightedge and feeler gauges before you begin, and try to finish close to that. DO NOT overdo the relief though. However, you could do as you suggest with no great risk, since it could easily be corrected by doing as I just said. But I wouldn’t use Bondo or Plastic Wood. I would use epoxy resin – black if you can get it, or mix in a little black powder pigment – charcoal will do fine. Make sure it’s room temperature setting, too. Araldite is popular in the UK, there will be something suitable in the hardware shop. Make it reasonably stiff so it doesn’t run everywhere, but not too thick – you want it to enter the pores of the wood. A few thin coats is as always better than one thick. Fill the area to a little proud, then sand down again using a board behind the paper. I have never had to do this on a fiddle but have rescued several guitars where long-nailed players had worn away the board using this technique. Clearly if this is a 10,000 dollar fiddle you might want to take great care, but neither repair is all that challenging. Rod- I was able to go through with the repair a week or so ago. I used JB Weld Woodweld, a 2 part epoxy recommended for wood, into which I mixed some powdered charcoal to get it black. I applied it with a plastic knife and scraped it down to fairly thin. I also formed a sanding block by applying the woodweld over a small block and covering that with a piece of paper of the same size, and squeezing it against the broad area of the fingerboard with rubber bands. This arc was not as tight as that of the fingerboard but I used it anyhow, placing 320 grit paper on it, doing most of the removal of excess epoxy, and then went to 400 grit. I checked my work mainly by lightly rubbing my fingertip along the area treated, feeling for high spots. When it felt smooth and uniform, I was done. The color was lighter than the ebony, so I used a black permanent marker on the material and wiped it with a tissue moistened with denatured alcohol to even out the application. Looks pretty good and seems to play right, if I say so myself. If I had it to do all over again, I would probably do it. But how to get the epoxy thin? And I would try to make a better sanding block, or even purchase the right tool. But for about $6 worth of materials I think I made out well and saved a chunk of cash. Will see how it holds up. Hi thanks for updating me about that, I’m delighted it worked out for you. Actual epoxy is very runny, almost like water, but the manufacturers add fillers to make it thicker. You can buy the runny stuff, which is sold for boat repair and other similar tasks, on sites like Ebay or from specialists. The trouble is the minimum quantities they sell are too big for a little job like that. Possibly scrounge from a boatyard?